Brent has just released the video for ‘Let The Rain Come Down’, which premiered on Rolling Stone and was filmed at the legendary Sam Philips Studio in Memphis for the ‘Elektra Sessions Live’. After the huge success of his debut dates in the UK in February, Brent will also be returning for a full UK tour in May (see dates below) plus two festival appearances including The Great Escape. On his earlier visit Brent sold-out headline shows in London and Manchester and stunned crowds in Glasgow at the Celtic Connections festival with his raconteur’s wit, tales of rural life in the Deep South and heart-rending performances of songs from his critically acclaimed debut album Shine On Rainy Day. 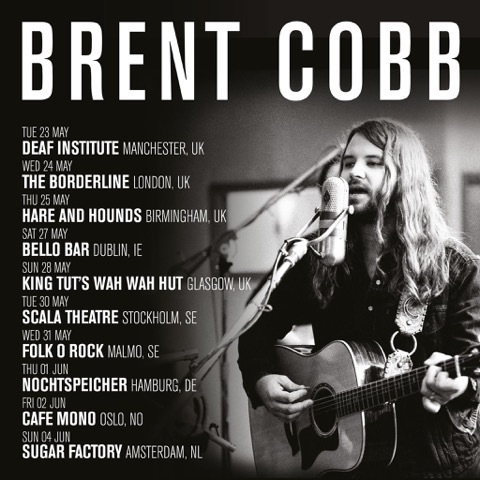 Brent recently announced further dates with Chris Stapleton in the US later this year and will be supporting Jamey Johnson and Margo Price ahead of his visit to the UK in May.